First season the racks of lamb with salt and pepper and bake at 350° F for 45 minutes. When ready remove from the baking rack and reserve half of the drippings. To prepare the gravy, mix the red wine, beef broth and cornstarch in a small saucepan over medium heat and let reduce as desired. In a separate bowl, combine the yogurt with the remaining vegetables, mint, lemon juice and cumin. Season with salt and pepper as desired. 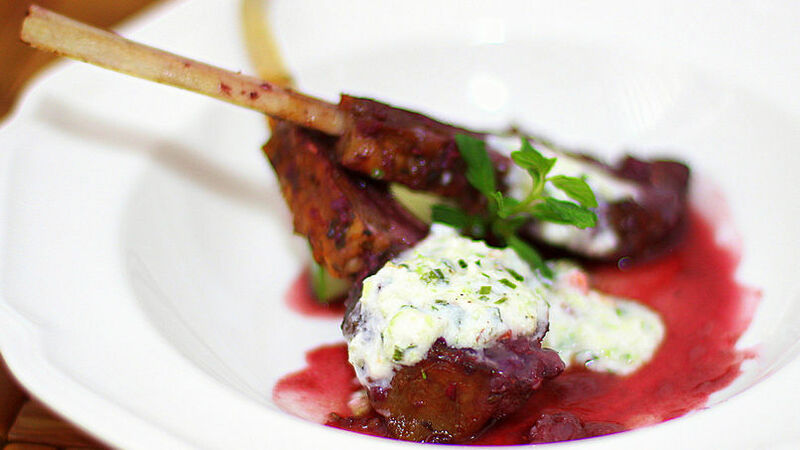 Serve the lamb over a portion of red wine gravy and dress with two tablespoons of yogurt raita. Garnish with a few mint leaves for a fresh presentation. You can switch the beef broth for chicken broth, if desired. If necessary, the cornstarch can be omitted or replaced with flour.